We take pride in the quality of out monogramming. Ours are not stick-on monograms. Sailors' Tailor monograms are satin-stitched right onto the product. Monograms look sharp, provide I.D. and prevent loss. Monogram useful boating gear for trophies and watch for sheer delight at presentation time! 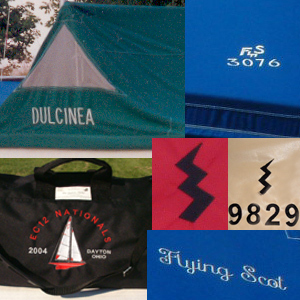 Since the monograms can be done in a range of sizes, they can be sewn onto polo shirts, duffle bags, boat covers and sail bags. Prices depend upon quantity to be done, size of monogram, and number of colors. Monogram Size? We try to make the monogram as big as we can fit in our 12 x 12 hoop. Placement? On covers we put the monogram over the foredeck just in front of the mast. Color? Done in a contrasting color. Most are done in black as it holds its color the best. Add a monogram to your order!